Australia took the lead through Jamie MacLaren but failed to win for the third consecutive match. Paul Okon made four changes from his starting team against El Salvador, with captain Curtis Good ruled out with a calf injury and so replaced by Brisbane Roar’s James Donachie. Higher up the pitch, the attacking three behind Adam Taggart was completely overhauled, with Connor Pain, Daniel de Silva and Andrew Hoole making way for Corey Gameiro, Jamie MacLaren and Ryan Williams, all starting for the first time in this tournament. Feyyaz Ucar unsurprisingly dropped Cumali Bişi, who had a poor game against Colombia, with Fatih Turan coming onto the right side of defence. Ucar also dropped Ahmet Calik, with Hakan Cinemre replacing him in central defence. Meanwhile, further forward at striker, Artun Akcakan, the captain, started ahead of Ibrahim Yilmaz, who was on the bench. A strange game to summarise – there weren’t many overriding ‘tactical’ features, there was little overall pattern, and yet there were three fine goals, although tellingly, two of them were courtesy of outstanding individual skill. The first prominent feature of the game was both teams carelessness in possession, particularly Australia, who sprayed a number of passes out of play early on. They also turned the ball over cheaply in midfield, allowing Turkey to build a number of quick counter-attacks through the centre. Jackson Irvine, in the centre of midfield, was especially culpable, over hitting two passes in the opening stages when trying to release the wide players in behind. Interestingly, Okon chose to play Irvine as part of a midfield two, switching to 4-2-3-1 with MacLaren playing higher up, and close to Adam Taggart. Turkey too played with a 4-2-3-1, although with the midfielders Ucan pushing up close to the no.10, Hakan Calhanoglu, they sometimes looked like 4-3-3 – similar to how Australia tilted their midfield triangle against both Colombia and El Salvador. Ucar encouraged his midfielders to come forward on the ball frequently, and intriguingly, in the context of the goals, they had a number of long range shots. Gradually Australia grew into the game, becoming more composed on the ball and beginning to construct more flowing passing moves. It therefore became easier to observe the changes in the dynamics of their attacking play – previously, with Pain and Hoole, they focused lots of their attacks down the flanks, trying to work the ball into one-on-one situations down the sides. However, with Williams and Gameiro now playing right and left respectively, there was more variation in their movement. 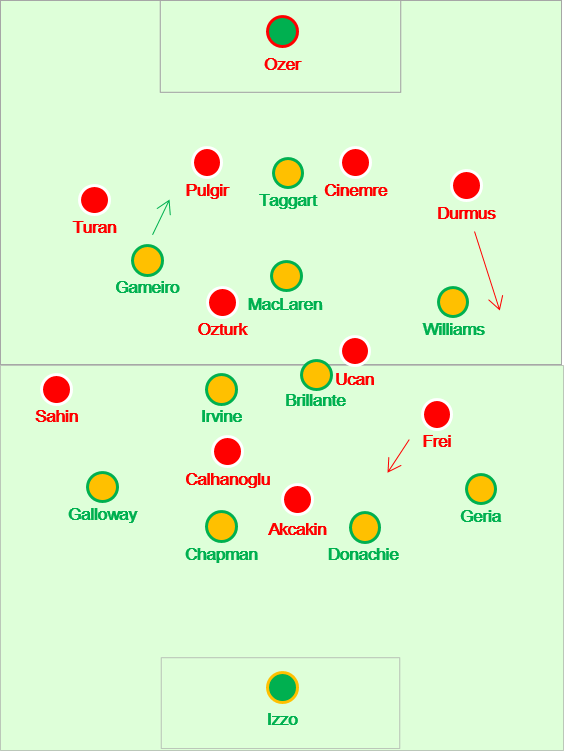 Generally, Williams tried to stay wide and play the “Hoole” role, but it was especially noticeable on the left hand side how Gameiro as more of a second striker, frequently making runs into the space between Turkey’s full-back and centre-back (unsurprising, as he is a centre forward by trade). This was, of course, how he ended up in the position for Australia’s best chance of the game, where Taggart cleverly found him in space on goal with a clever flick – and indeed, the Newcastle Jets striker simply looked more comfortable with players more willing to make runs in behind him. Meanwhile, Williams had Australia’s other clear-cut chance, when he fired a volley at goal from a smart cutback from MacLaren. Again, the move was illustrative of the difference in dynamics – MacLaren moved out into a wide position, and Williams drifted inside into a penalty box position. Turkey’s attack was varied, and they enjoyed more possession than Colombia and El Salvador (and so Australia’s banks of four were more obvious than has been the case). As aforementioned, the midfielders often strode forward from deep, sometimes they looked to play through the physicality of Akçakın, and other times, they built up play down one flank, before switching the play intelligently to the opposite side, and thus dragging Australia’s defence out of shape. Often, it was the right-winger, Cenk Sahin, who moved out close to the touchline while his team had the ball, anticipating the crossfield pass. It was almost as if Turkey had identified this as a weakness – however, Sahin was very predictable when he received the ball, always looking to cut inside onto his preferred left foot. Whereas this ploy was wildly successful against El Salvador, as he scored two goals, it was less so here, because Sam Galloway recovered quickly and closed him down (and the diligent tracking of Gameiro ahead of him was also a factor). Instead, it was the left winger, Fulham’s Kerim Frei (referred to as Kerim Koyunlu here) who looked more dangerous, drifting inside into central playmaking positions and often ghosting past Australian defenders with deft touches. His narrowness opened up room for the energetic İlkay Durmuş, who provided good width down the side and provided some dangerous crosses for Gençlerbirliği teammate Akçakın. However, there wasn’t an abundance of creativity in this game – Australia’s defence looked solid (with Connor Chapman switching to the left side of the central defence to accommodate Donachie), while Turkey were happy to sit off out of possession and pressing when the ball was played into midfield, with Fenerbache midfielder Ucan sometimes occupying Irvine off the ball (as Coca had done so successfully in the previous match). The situation in the group, and the context of the match, increasingly came into play. Colombia had taken the lead against El Salvador, so Australia really needed to push forward for a win, so they became more positive after the break. The full-backs pushed higher up the pitch, the tempo of passing from the back became more urgent, and Okon’s enforced substitution spoke volumes – having lost Galloway, his left-back, to injury, he chose to shift Jason Geria across to replace him, dropping Josh Brillante into defence and introduced Daniel De Silva into midfield. The 16 year old moved alongside MacLaren in the midfield triangle, with Irvine moving to the base – Australia were now 4-3-3, and really going for it. Did that have an influence on the goal? Probably – what was important though, was that Brillante was overlapping past Williams when he sent in the cross, because it pushed back Durmuş and opened up space (and later, he sent in a dangerous cross of his own). That meant Williams could pick out MacLaren’s well-timed run (he would have been in that position anyway regardless of the change in formation), and Australia had the lead. It didn’t last long, as Calhanoglu equalised two minutes later with a superb strike from range. It probably wasn’t coincidental that Turkey had had so many long-range attempts earlier, and the manner of the goal wasn’t out of keeping with the majority of their “chances” during the game. After that, the game became more open, with both sides shifting from one end to the other in search of a winning goal. Australia became more stretched, as the full-backs pushed high up the pitch, and the two central attackers moved into advanced positions. That left Irvine isolated in front of the defence – as the lone holder, there was often space on either side of him, a problem compounded by the movement of Okay Yokuslu and Calhanoglu. Although Turkey’s coach made a double change at the start of the half, only Okon’s introduction of De Silva was particularly interesting. Okay Yokuslu stayed a little deeper alongside Alpaslan Ozturk, but Turkey’s shape remained the same, with Ibrahim Yilmaz offering a little more pace upfront. 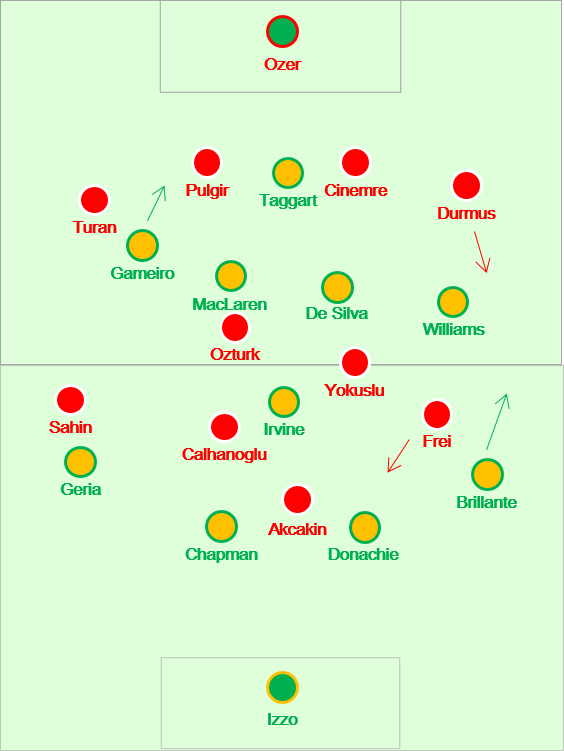 Okon had thrown the dice with De Silva – Hoole swapped with Williams, while Pain’s introduction in the eighty-fifth minute meant Gameiro went centrally, alongside Taggart. Two minutes later, Yokuslu scored the decisive goal, reminiscent of Shinji Ono’s effort against Brisbane Roar (even the celebration was similar). An odd game. The goals were isolated from the tactical features, although all three were technically excellent, and wonderful pieces of skill. It was interesting to see Australia’s attacking dynamics change with different players, but like the previous two games, they didn’t really create many chances of note despite enjoying good possession. Even though they took the lead in all three games, it was only ever a one goal lead – which allowed the opposition to come back into the game every time. However, there are promising moments, and signs of cohesion. The key is to take lessons from this tournament, learn from them, and improve for the future. There’s little good in introducing a National Curriculum and applying it, if you can’t learn from its weaknesses, adapt to them and become stronger as a result.